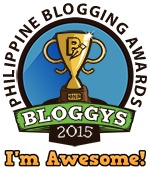 Sneaky chickens, flying Ninjas, brain surgery and an unforgettable horse race! Welcome to the surreal shadow puppet world of Sticks, Stones, Broken Bones. Using household objects and bits of rubbish, Bunk Puppets transforms simple objects into hilarious silhouette stories. In each scene, the puppetry is performed in front of the shadow screen, so that the audience gets a close look at the visual trickery. Old toys, brooms, boxes and discarded clothing are deftly stitched together to create shadow puppet stories and characters. Delighting audiences in dozens of countries, Sticks, Stones, Broken Bones is a hilarious fusion of shadow puppetry and physical theatre. It’s a visual feast for the imagination! Come, experience one man's playful vision of wonder and nonsense. 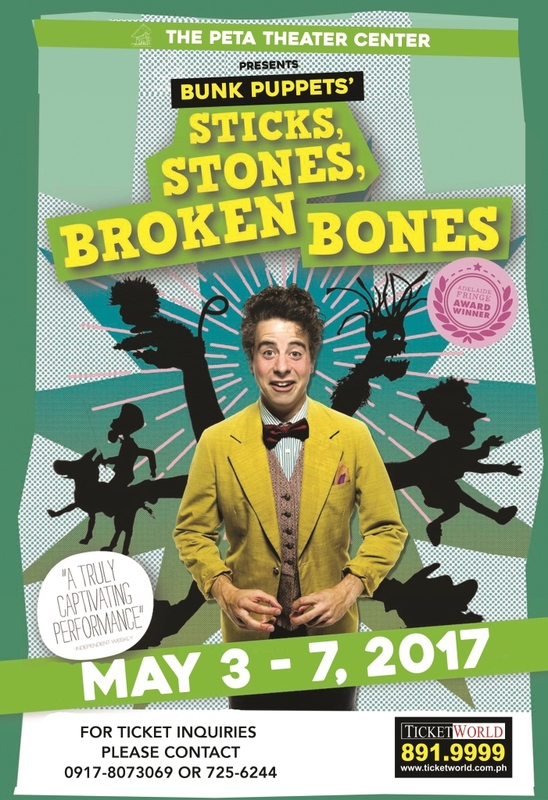 Sticks, Stones, Broken Bones is a wordless and imaginative puppet comedy show for all ages running for 50 minutes. (Though some bits are a wee bit scary for under 6 yrs old). Based in Melbourne, Bunk Puppets company director, Jeff Achtem explains “Traditionally, shadow puppeteers create their silhouette performances by manipulating puppets behind a screen. We perform Sticks, Stones, Broken Bones in front from the screen, which means we can use cinematic effects like close-ups and zooms. The audience gets to witness every bit of the puppeteers moves" he says. 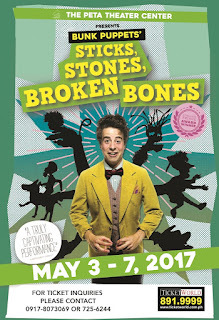 Sticks, Stones, Broken Bones comes to the Philippines on May 3-7, 2017 with seven limited performances at the PETA Theater Center. To complete this rare experience, there will also be a series of puppetry workshops for kids and adults alike facilitated by the founders of Bunk Puppets. Tickets and workshop slots may be booked through Ticketworld or by texting (0917) 807 3069. For more information about the show, visit http://www.bunkpuppets.com and http://petatheater.com.